Every once in a while someone comes up with an idea so useful that it’s hard to believe no one thought of it before. Wheeled luggage, for example, was the result of a simple premise and has since saved the backs of countless travellers. Unfortunately, in keeping with the law of averages, for every brilliant idea there are a thousand awful ones. Out of that thousand, one or two have misread awful’s room number and are knocking on the door of insanity. Despite clearly belonging in this last category, the following products are, at the time of writing, all available to buy. These pants claim to deter thieves by being, frankly, disgusting. There’s a hidden pocket for valuables, which isn’t unusual, but the big selling point is that they come ‘pre-soiled’. Best case scenario is that anyone going through your belongings simply leaves with the opinion that you are a disgrace to personal hygiene. Worst case is that they already know this ploy and you’ve just saved them ten minutes worth of searching. Trying to sleep in an airplane seat can literally be a pain in the neck, but if the alternative is wearing this contraption then surely most people would opt for agony and a couple of Advil. Ignoring the inconvenience of having to carry the damn thing, who wants to look like they’ve just lost a fight with a Thighmaster? A product that filters out unpleasant smells ought to be perfect for any aircraft, with the reduced cabin pressure and questionable food providing it with plenty of work. However, while this cushion may be useful in certain situations – retirement homes, for example – there’s no point marketing it as a travel companion unless every single passenger has one. If not, any Gas-B-Gone user has paid good money to clean their farts while sitting in a cloud of everyone else’s. When it comes to ridiculous travel accessories, trust the Chinese to come up with one that is dirt cheap and does the job perfectly. Basically a summertime balaclava, the Face-Kini is supposed to be worn with a full wetsuit for the ultimate in sun protection. No more bottles of messy, expensive sun cream for anyone who buys one of these. Just don’t wear it on board an airplane; unless, that is, you actually want the flight to be met by several men with big guns. Check out these photos of the Face-Kini in action. Especially for the germophobe in everyone’s life, these covers are supposed to fit over an economy seat (First Class size available on request!) and thereby protect the user from all the filth left behind by the thousands who have gone before. Unfortunately, as it doesn’t come with armrest covers, tablecloth or sealed oxygen tent, it’s basically an expensive blanket. While there may be an element of truth to the manufacturer’s claim that a dry atmosphere causes all the ailments associated with air travel, this is yet another example of using a sledgehammer to crack a nut. Drinking plenty of water aids hydration and, for those buying into the theory that ‘dry lungs’ are susceptible to infection, there are plenty of nasal hydration sprays out there that don’t involve wearing a Glade air freshener all flight. This combined wheelie-bag/seat/sound system is apparently what happens when an inventor hasn’t really thought stuff all the way through. Yes, it is a sturdy wheeled case that will take a few knocks. Yes, at the push of a button, the top slides to form a pretty comfortable seat. Yes, it comes with optional rechargeable sound system to annoy your fellow travellers. Then again, yes, it weighs a whopping 14lbs and costs north of US$500. That’s pretty expensive for a bag that, for most airlines, would have to be practically empty to get it into the cabin. A handheld, self-directed, self-squeezed water jet in, by definition, a confined space with zero visibility of the target. What could possibly go wrong? It isn’t clear whether this is so-called because you stick your head into it, or because it looks vaguely similar to the flightless bird…if someone had snapped off the poor thing’s beak. Either way, while it may well be, as the maker’s say, your own micro environment, the fact is you will have shelled out over US$100 for a travel pillow and won’t be able to see people laughing at you when you’re in it. Despite its seemingly ridiculous appearance, the product does have a large Facebook following who share photos of themselves wearing their pillow. We’re still undecided if this is sheer genius or the most insane travel product ever. 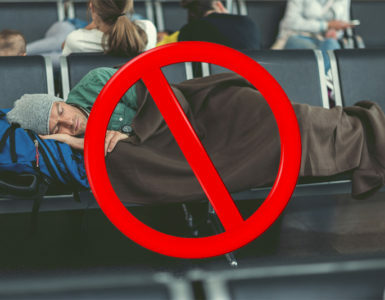 Comprising a tent, air mattress, pillow, ear plugs, eye shades, toothbrush and even an alarm clock and reading light, it is sold as a home-from-home in the event of a cancelled flight. However, what eventually tips the Mini-Motel into the insane bracket is the product’s intended area of operation. Most major airports have security officers that frown upon travellers even being in the terminal overnight. It is not very likely that they will react well to someone setting up their own house. Have you ever seen any of the above on your travels? Perhaps you own one and never go anywhere without? Let us know by leaving a comment. I can’t speak for the average Joe, but the Humidiflyer 100% works for singers in maintaining their vocal health. Where normally it would take me a long time after a long haul flight to get my voice back into shape ready for a concert, I’m pretty much ready to go if I use the humidiflyer. Just my two cents. And, just preemptively, I’m not connected to the company at all in case I get blown up by anyone. Not sure why a regular person would need to use this, but I understand the want for sports teams to use it and I 100 percent get why singers use them. Tried and proven. Never fly without. Cheers. I dunno, I sat next to a bloke from SYD to DFW who really could have used that fart cushion. Just saying…..